Land disturbed by fire is an ‘essential climate variable’, which are global datasets for the key components of Earth’s climate. Fire-scar mapping is also used for managing natural resources, assessing fire risk and for adopting mitigating strategies, for example. Thanks to Copernicus Sentinel-2’s ability to zoom in on our planet, researchers have discovered that there are more areas are being affected by fire than previously thought. A paper published recently in Remote Sensing of the Environment describes how researcher used the high-resolution imaging capability of the Copernicus Sentinel-2 mission to produce the first detailed continental map of burns caused by wildfires. Sentinel-2 is a two-satellite constellation built for the EU’s Copernicus environmental monitoring programme. Each identical satellite carries a high-resolution multispectral imager. The mission has a myriad of uses, particularly related to monitoring the health of world’s vegetation and mapping how the surface of our land changes. The authors focussed on sub-Saharan Africa as the region accounts for around 70% of burned area worldwide according to global satellite databases, making it the ideal testbed for evaluating the potential for improving the understanding of global impacts of fire. They found that 4.9 million sq km of land had been burned in 2016, which is 80% more than reported with information from coarser-resolution satellite sensors. These new-found areas comprised mainly burned areas smaller than 100 ha. Although usually not as catastrophic as large fires, small fires are linked to land-use change, particularly if they have been set to clear land for agriculture or grazing. 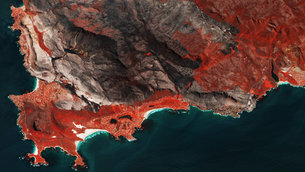 Lead author, Ekhi Roteta from the University of the Basque Country, said, “This increase the amount of burned area and the fact that it is made up of small areas came as no surprise as Copernicus Sentinel-2 has a resolution of 20 m, more than ten times the zoom of other satellite instruments. The research and data product were developed in the framework of the Fire Disturbance project, part of ESA’s Climate Change Initiative. It involved processing 11 000 Copernicus Sentinel-2 images. The product is named FireCCISFD11 and is publicly available from the CCI Open Data Portal. The project is also generating global burned area products from Copernicus Sentinel-3 sensors, as well as radar algorithms for detecting burned areas in cloudy regions.